Twitter is going toe-to-toe with the goverment over messages on the account of Malcolm Harris, an Occupy protester accused of disobeying police on the Brooklyn Bridge in New York City. In one case, at least, the little blue birdie isn’t about to bow to big brother. Twitter is refusing to hand over the message history of one of its users to a New York state court despite requests from the government. 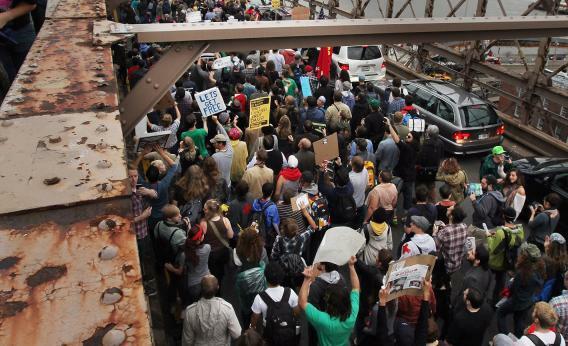 Occupy Wall Street protester Malcolm Harris is accused of willfully disobeying police instructions not to block traffic during a contentious protest on the Brooklyn Bridge last October, and prosecutors say his tweets reflect as much. But Twitter is resisting the court order on the grounds that, as reflected in their terms and service, customers’ tweets are their own personal property and thus protected under the fourth amendment against unlawful search and seizure. The move has been hailed by the ACLU, which in a blog post concerning the matter said, “If Internet users cannot protect their own constitutional rights, the only hope is that Internet companies do so.” There you have it, folks: As long as you don’t pull a Wiener, Twitter can actually help protect your privacy. Video produced by Jim Festante.